Illuminated signs have lit up our world for many years. 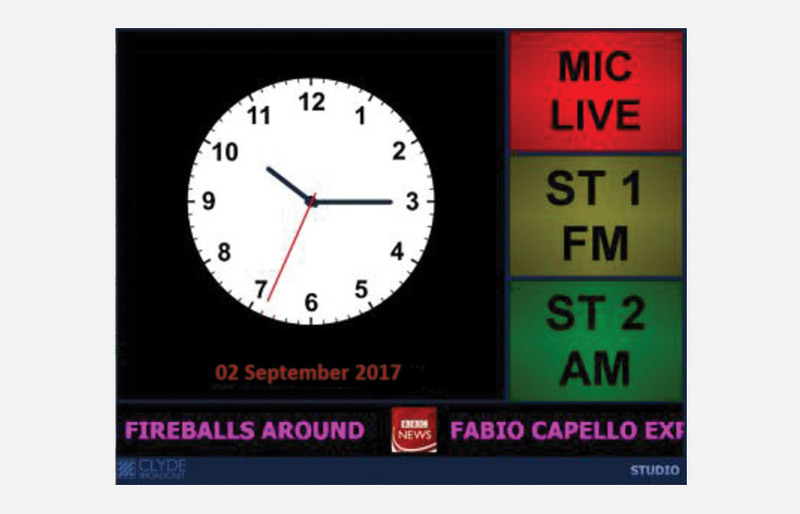 The Clyde Broadcast Studio Indicator Display takes the concept to the next stage, incorporating indicators, time and information on a video display. Using standard, low-cost, wall-mounting, flat-screen displays, this simple software application runs in the background on virtually any PC. The source of time can be synchronised to either a station-wide reference (e.g. an NTP Server or GPS interface), or to the local PC. Analogue and digital displays are offered (user selectable) and as standard there are three on-screen displays, typically for Mic Live, On Air and Phone, with user-configurable text, back-ground colours and display type; flashing, burst and continuous. 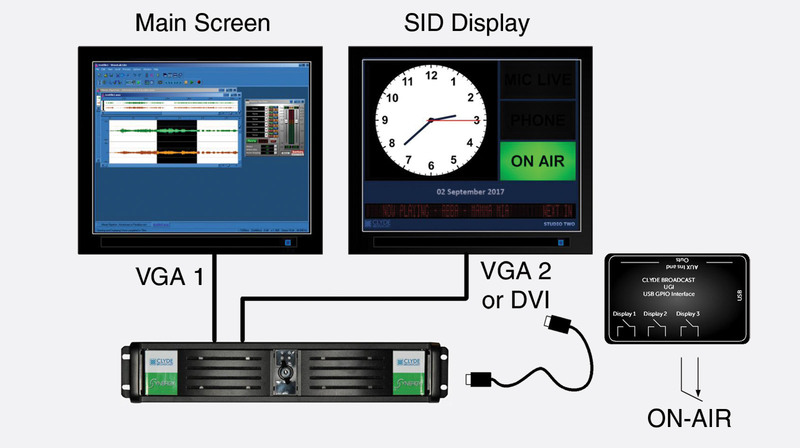 Displays are connected via standard DVI (if supported) or VGA cables (readily available up to 10 metres), and the use of an external VGA splitter allows several displays to be connected in parallel to the same PC, for example on different walls inside and outside of the studio. For long cable lengths, high-quality, larger conductor cables are recommended. Interface to the on-screen displays is via an external USB GPIO interface (supplied), requiring external closing contacts. This and the supplied dongle acts as a licence, but any number of displays may be driven from the same PC, by using a suitable VGA splitter. 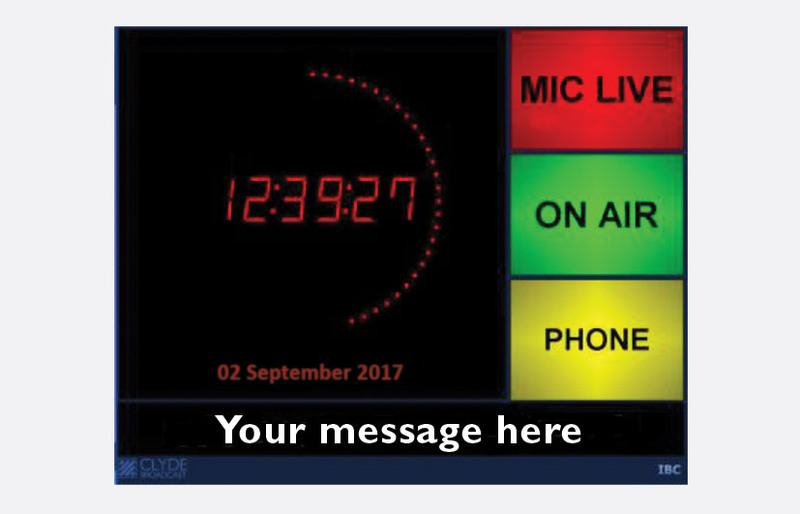 A scrolling text message can be displayed, which can be set to read the 'message of the day' or pointed to a network location so that 'Now Playing' and 'Playing Next' information from a supported on-air playout system can be displayed. The display screen also contains a place-holder into which a customer's logo can be 'inserted'. 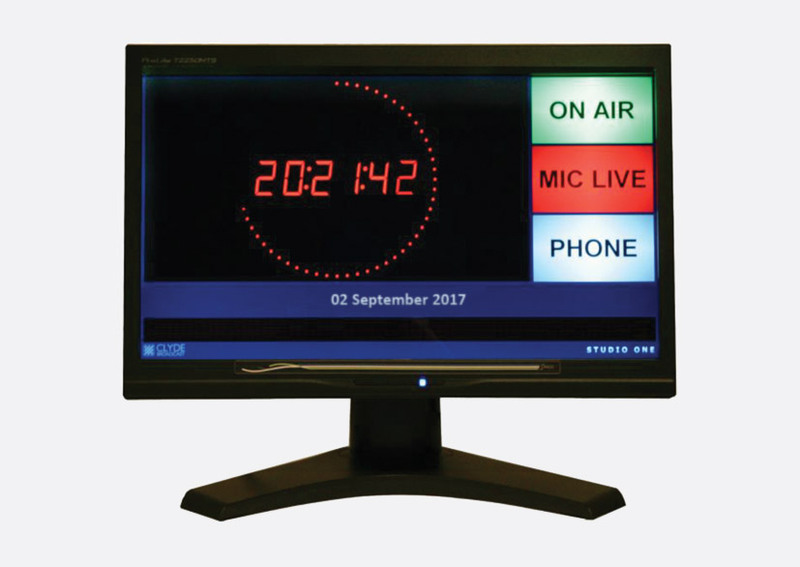 Each unit is supplied with a 'User Configuration' tool, which allows text, background colour and mode to be set for each of the displays, as well as source of time and type of clock display. It runs on any current Windows OS with a 2GHz or faster Pentium processor, and uses about 30Mb of memory, and between 1% and 2% of the processing power of a dual-core processor.